Celebrate the first long Spring break at the beach! Take advantage of the sunny days, spending your holidays in total relaxation in our exclusive Frontemare Spa, enjoy long walks on the shore or a bike ride on the coast, or take a day trip to Venice and discover the beautiful islands of the lagoon. 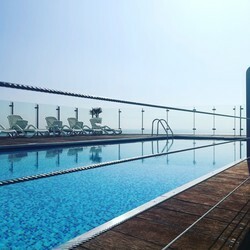 free entry to our wellness center on the top floor, with amazing sea view; it features a heated outdoor pool, Finnish sauna, turkish bath, whirlpool with salts of life, relaxation area, possibility of massages and beauty treatments (with surcharge). SPECIAL OFFER FOR RESIDENCE "SUNBEAMS"
Make sure you take advantage of our great offer to spend your holidays at a convenient rate! One apartment with the amazing view on the sea side from its heights along with the exclusive comforts of the services of the hotel, such as the wellness centre, the swimming pool, the private beach in front of you and the reception open 24h/24, at a really SPECIAL PRICE! Your holidays at a very special rate, starting from Euro 100.00 per night! Summer beginning is the best period all year round, when the mild spring turns slowly into hot summer, and the beach is not crowded yet... let's take advantage of our fabulous offer for your early summer holidays at a really special rate! Rate INCLUDE linen and towels at your arrival.